Flame-loving chefs are taking a grill-centric approach to cooking, elevating humankind's oldest and simplest culinary technique into its tastiest. Here are 8 excellent new places around the country. 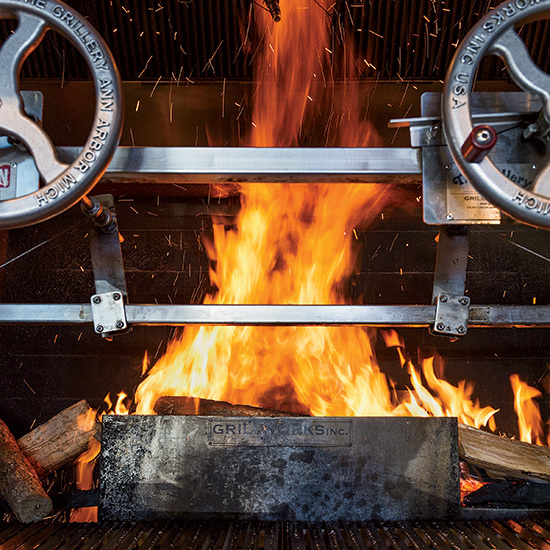 Chef Eli Kulp grills over Japanese-inspired hardwood charcoal. akitchenandbar.com. The giant stack of firewood in the dining room is the only fuel at this neo-primitive spot. arcrestaurant.com. Raised in Hermosillo—Mexico's unofficial carne asada capital—Daniel Bojorquez is a grill virtuoso. labrasasomerville.com. At this tiny Argentinean-style restaurant, grilled-meat juices become an umami-rich basting oil. oxpdx.com. Charlie Hallowell turns out both perfectly cooked chops and impeccably charred flatbreads. penroseoakland.com. The open kitchen has four fire-focused sections: a mesh grill for tiny items like fava beans, a cast-iron plancha for breads, a grill grate for meat and a hearth for ember roasting. tbdrestaurant.com. Ashley Christensen will use fire to coax deep flavors from vegetables at her next restaurant, opening this fall. ac-restaurants.com. The flame-driven cuisines of Europe and South America inspire Chris Hastings's new project, slated to open this summer. Coming soon.